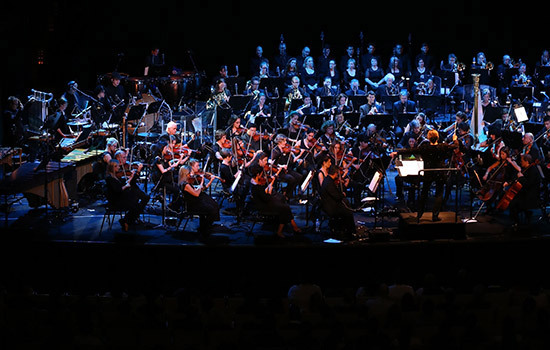 : Rochester Philharmonic Orchestra will partner with RIT and The Strong to present “Heroes: A Video Game Symphony,” 8 p.m. Thursday, Oct. 26, in Kodak Hall, Eastman Theatre. The Rochester Philharmonic Orchestra will continue its special video game concert series with “Heroes: A Video Game Symphony,” at 8 p.m. Thursday, Oct. 26, in Kodak Hall, Eastman Theatre. The show—the story of a hero’s journey told through the fantastic worlds of video games—is co-sponsored by Rochester Institute of Technology’s MAGIC Spell Studios, RIT’s Center for Leadership and Civic Engagement, Upstate Region Interactive Technologies Hub and The Strong. Cosplay (costume play) is encouraged at the performance. Led by guest conductor Miriam Burns, the multimedia performance features music and art from popular video games The Elder Scrolls, Final Fantasy, BioShock, Portal and more, together with Rochester chorus group Madrigalia. Following the performance, Shannon Symonds, curator from The Strong’s International Center for the History of Electronic Games, will lead a free panel discussion alongside Burns; Rob Mostyn, digital games hub coordinator for RIT’s MAGIC Spell Studios; Mark Watters, director of the Beal Institute for Film Music and Contemporary Media; and Ryan Hamlyn, co-producer of the event. RIT, which was recently named one of three Digital Gaming Hubs in New York state, hopes to increase the economic impact to New York state by fostering innovation and creating collaborative activities that spur new games or companies as well as providing resources and mentoring to encourage students and entrepreneurs to enter the growing gaming industry. In addition, the gaming hubs will assist existing companies with gaming concepts, technologies and trends and host events focused on assisting the gaming community. RIT’s MAGIC Center is a university-wide research and development laboratory and a production studio that assists in efforts to bring digital media creations up to marketplace standards and commercialization. Faculty, staff and student researchers, artists and practitioners come together to create, contextualize and apply new knowledge in a multitude of related fields and disciplines as appropriate not only to STEM or the arts and humanities, but their intersection. RIT’s MAGIC Spell Studios, which will open a new building in fall 2018, focuses on nurturing and growing new companies and publishing and distributing their projects. In addition, RIT’s game design and development program was recently ranked second at the undergraduate level and fourth at the graduate level, according to the 2017 rankings from The Princeton Review. Tickets for the concert start at $24 and are available online at rpo.org, by phone at 585-454-2100, or in person at the RPO’s Patron Services Center (108 East Ave., Rochester) and at all Wegmans That’s T.H.E. Ticket! locations.